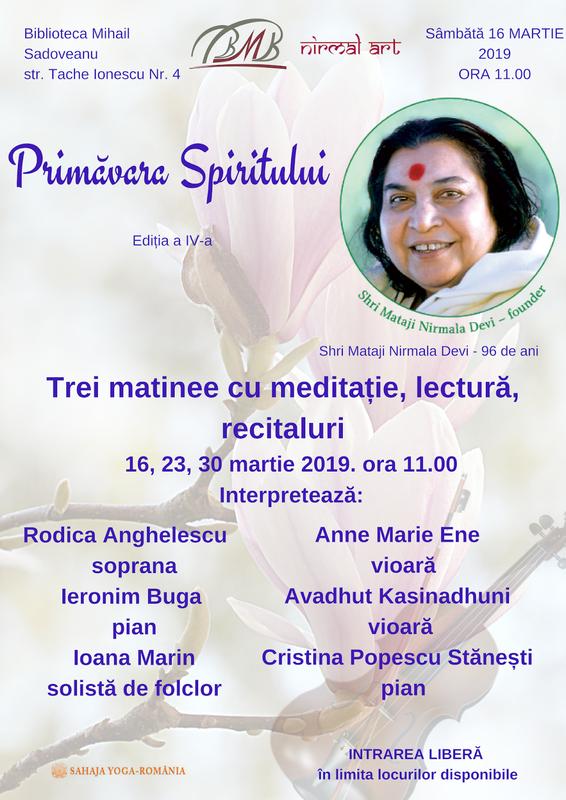 Romanian sahaja yogis celebrate every year around 21st of March the Birthday of Shri Mataji Nirmala Devi, the guru who gave to the humanity the most precious gift: Self Realization. 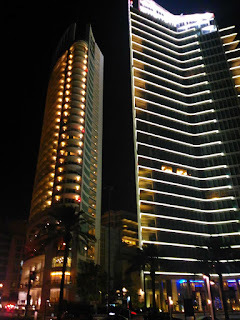 Public programmes, with or without concerts are held in several towns and centres. 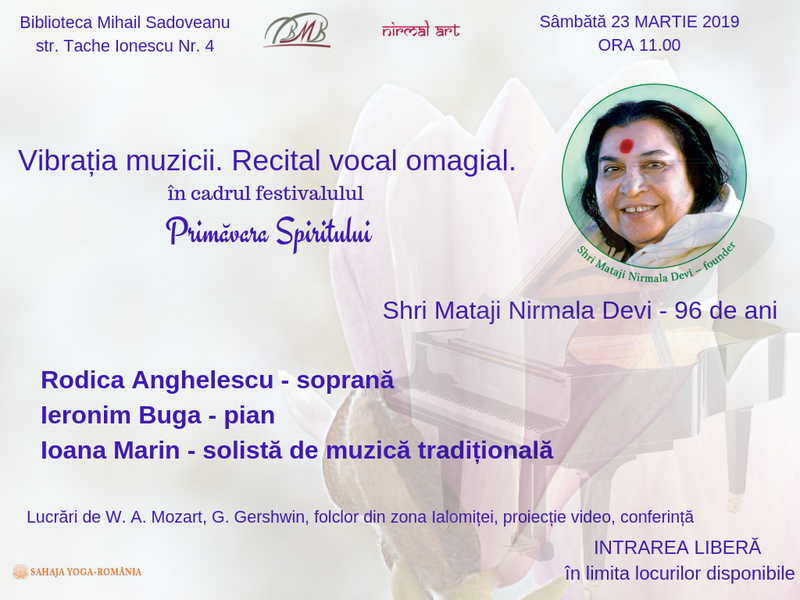 Programmes started on the 16th of March with Spring of Spirit festival, 4th edition. Professional artists as well as amateurs are performing in these programmes, documentaries are being watched or just excerpts from Metamodern Era read. Music is very diverse: from bhajans to traditional Romanian, from classical Indian to chamber music and opera. Enjoy our posters. We come back later with movies. A small country in Transcaucasia, the first Christian state in the history, following the ancient Urartu, Armenia has charmed our views and hearts this summer. We were there a group of volunteers and one professional artist touring and willing to share the light of Sahaja Yoga and universal cultural values with the inhabitants of this land. 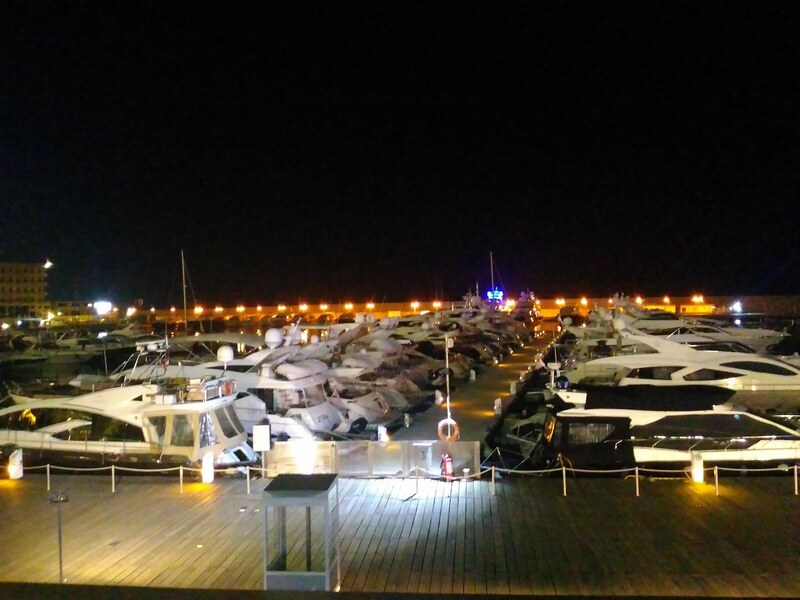 There are lots of stories to tell and lots of experiences to describe: the tourist part, the multicultural programmes we had, the human contact, the spiritual life and the vibration reality. The first stop was in Gyumri, where some of us traveled with the train from Yerevan. The landscape was rather poor, except for seeing for a while far away the Ararat Mountains. But various birds as storks, bee-eaters or hawks are embellishing our sight. The most impressive place was Goris, surrounded by mountains and interesting rock shapes that we believe they might be swayambhus. Not far away from here the Wings of Tatev cableway took us from Halidzorand to the Tatev monastery in Armenia. Tatev monastery hosted here the one of the most important Armenian medieval universities. All the way the Caucasus Mountains showed to us simplicity and majesty. Rocky and arid mountains and very little places where forest can have roots. Yerevan was the last stop with its majestic buildings, clean and elegant streets in the centre, and stunning collection at History Museum. Couldn't resist the temptation to visit Yerevan radio, famous in the jokes from URRS times. we saved a day for Garni, where we could see the temple, the Symphony of Stone and take a bath in the ice cold river. About the human and sahaj experience, we learnt a lot. 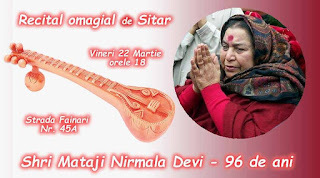 The most important, that the connection in Sahastrara works better than any plans, that the honest desire and confidence work and that there is no such a thing as "too much" "too complicated" or "religious conditioning". The work is alive and it is done by the divine power if we are correctly tuned with it. 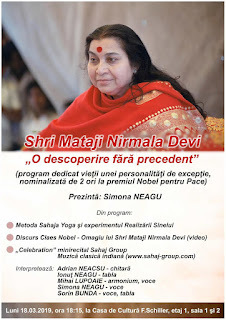 If we are trying to fit this within the borders of our petty minds, than things become artificial, than we start either blaming ourselves for not being good enough, either the people for having conditioning or lack of appetite for knowledge, either the Sahaja Yoga itself. In many cases, the local artists and children who sing and play traditional music were joining our programmes. And this created bonds between the countries participating. No, it was not all joyful and perfect, but it was a useful experience and a gain for this country. The vibrations of Armenia are not easy. They recently had a revolution about which the international media kept complete silence. It was difficult to cross Agnya and go into meditation. Only after returning to Romania I could fix this problem properly. Also left void was to be felt. Today 23 april we celebrate Saint George birth. In the Romanian language he is called Saint Gheorghe. 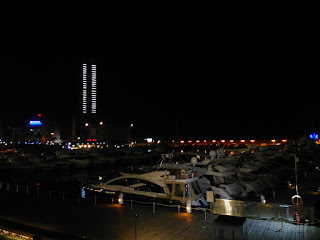 There are many legends about him and everybody knows he is the patron of England, but I think less known is that Saint George is the patron of Beirut too. It is said that Saint George killed the dragon in Beirut, before the dragon could kill the daughter of the Emperor. 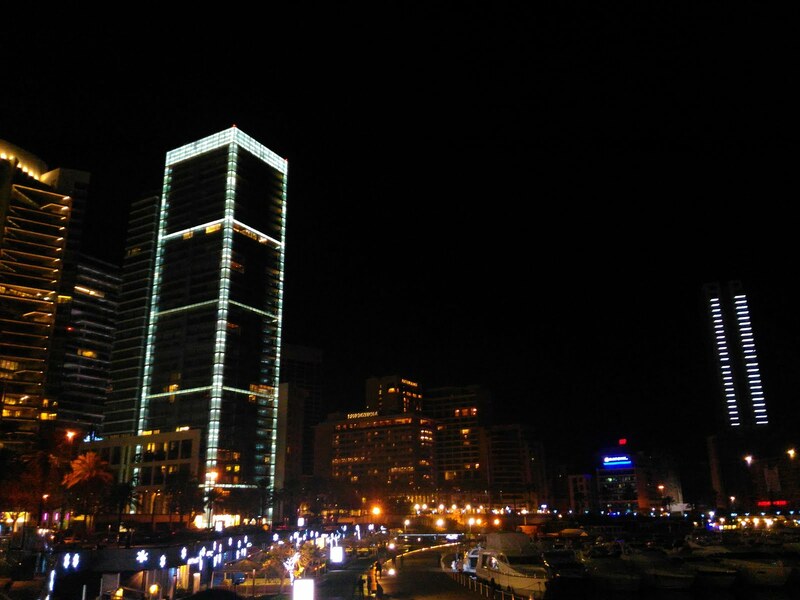 The place where the dragon lived it is believed to be Bay of Beirut called The Saint George Bay. It is said that about 30 minutes drive from the slaying site there is a cave where Saint George washed his spear and that the waters in the cave have miraculous power for some ill children. Some Muslims call him Al-Khadr. It seems that the well from where the Dragon used to come out is now in the playground or a Muslim primary school and that the ground where the dragon was slain is near the school and the Crusaders built a chapel over the spot and since 17 th century the place alternates between a chapel and a mosque. 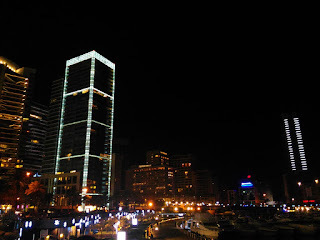 While in Beirut, last December (2017) some Romanian friends took me there, to the Beirut Bay, for a walk. I did not know why I felt so joyous. At that time I had no idea about all this. Tonight I told my friends from Beirut about Saint George Bay and they where surprised,they had no idea about this! The Choices We Make Are Really Just a Matter of Taste? I had this discussion we some sahaja yogis in the past: what good music is, what quality is and so on. I affirmed that bad choices are a matter of awareness: many people never heard classical music, for example, and this is why they don't "chose it"; they were never exposed to it and they believe it is for rich people, while my opponents said it is just a matter of taste. If people like house, rap, etc. it is their business. Well.....I discovered something more in the last days. I made some experiments on myself. Sometimes work exhausts me physically and mentally so I chose different kind of relaxation: watching a movie, watching a stand-up comedy show. Of course, my meditations are not so good when I am like this. When I have deep meditations and above my Sahastrara the vibrations are really strong, I can't bear cheap fun anymore. 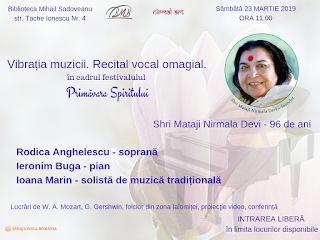 My Spirit demands something else: classical music, Indian classical music, reading a book. So our "choices" are made by who is dominating our being: the Spirit or the other parts. Because art has vibrations and whatever has light addresses directly to the Spirit. Whatever has darkness, addresses to the dark side of the people. Whatever is cheap and excites the body (like some dance music, for example) it is more related to our animal part. Art is art, is culture, is carrying vibrations and elevates also the not realized people. Entertainment is another kind of business. Yes, sometimes we all need to shake a little bit the animal inside us through a tribal dance. But we all should know what all is about and that is not the "pure joy" moment. 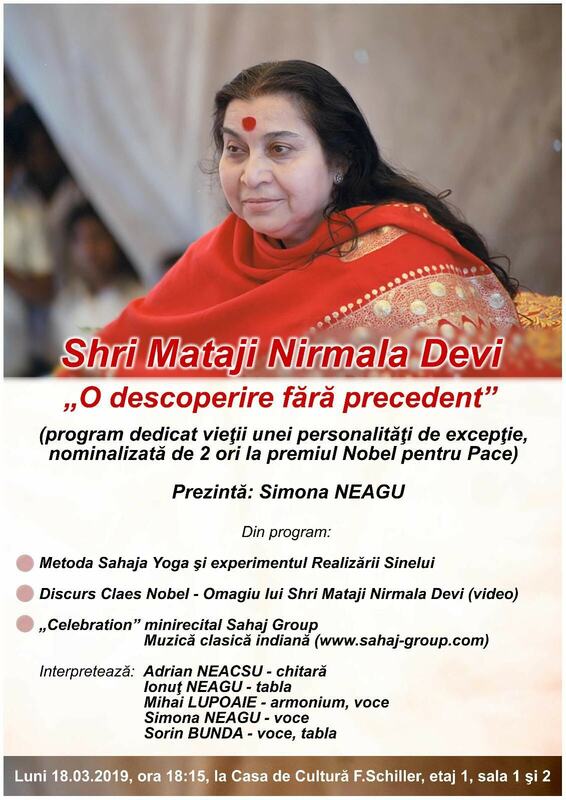 In Romania, the celebration of Shri Mataji Nirmala Devi's Birthday by public programmes was never interrupted. 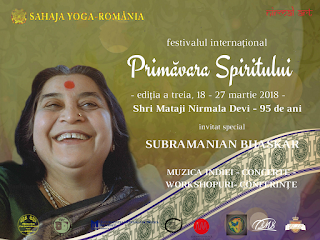 For the 3rd year already we are organizing a festival dedicated to this special event, called The Spring of Spirit (Primăvara Spiritului). 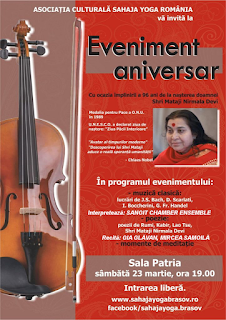 This year the festival has international guest artists: Pandit Subramanian Bhaskar and his student Shubham Andheryia. A series of concerts, recitals, workshops and conferences will be organised to celebrate our Mother's birthday. 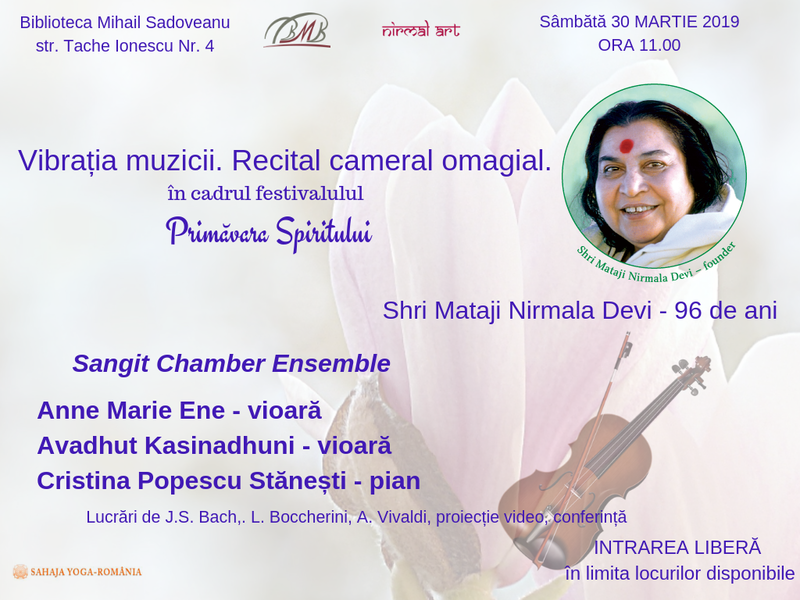 Four cities announced their participation to this event: Bucharest, Ploiești, Cluj, Brașov. 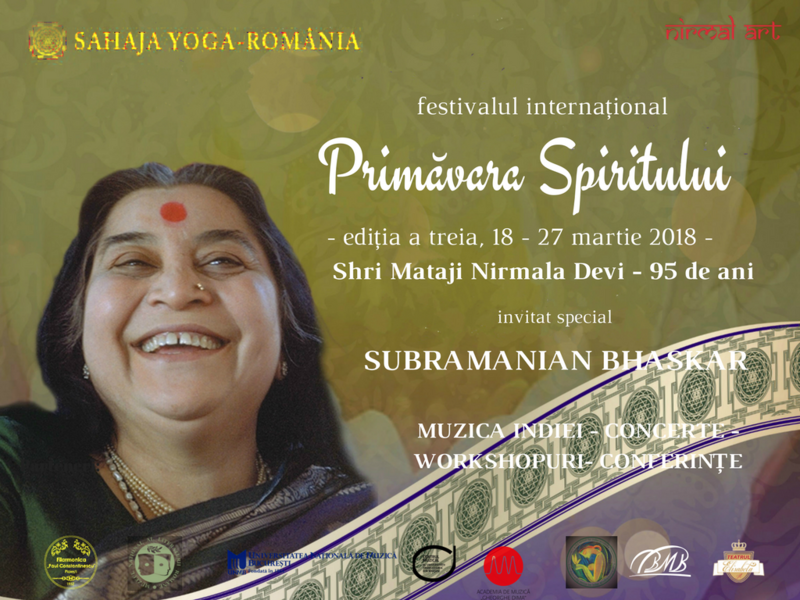 The 3rd edition of the Spring of Spirit Festival is organised by two sahaj NGOs (Nirmal Art and Sahaja Yoga Romania) in partnership with various cultural institutions from Romania.